I am still on the fend for yourself diet and very much against my promise to Lyn to eat healthy I could not resist the temptation when at BJs and there it was as if it had my name on it a full brisket sitting in an open space in the meat counter all by itself. It was calling me. I told her that I needed it for a Patriots game day recipe and besides most of the fat will render off. She begrudgingly let me win the discussion not only because the fat content in this cut of meat is not healthy for me but I feel more that she knew the aroma that spreads through the neighborhood and the house will be driving us crazy all day. I don’t know about you but there is something about cooking any style of slow cook meal that is tortuous. Go out for a little while and when you come back and enter the house OMG. And I never use that terminology. Think of last Turkeyday when you enter the house and you will know what I mean. Remember this was a spur of the moment thing so I basically winged it. 1 whole brisket about 8 lbs. Presoak some wood chips when ready place in smoking tray. IF you do not have one I use two sheet of aluminum foil make a pouch and put some holes in it. I have used a disposable tin foil tray not covered place on the flame. I dragged a sharp knife across the beef not going very deep and made a diamond pattern on both sides. 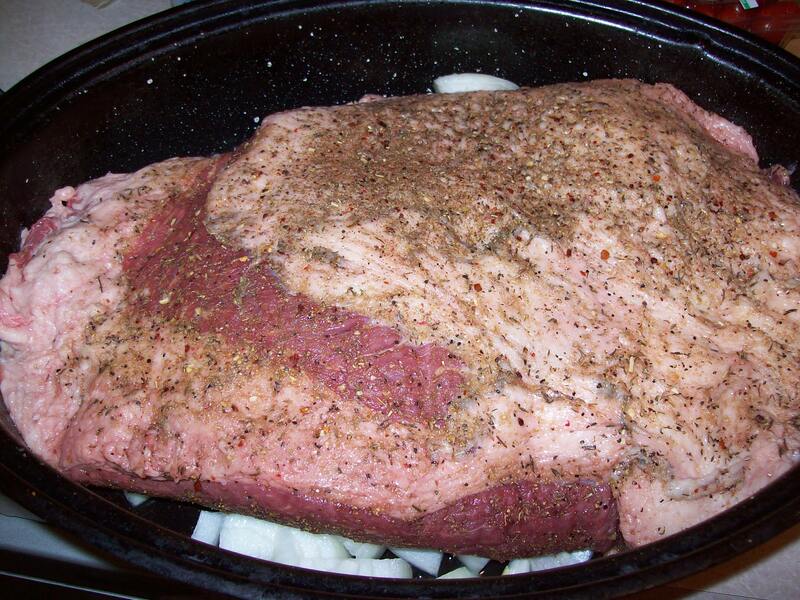 Then I rubbed the beef with my rub, see pulled pork receipe. Wrapped and refrigerate for 1 hour, overnight is much better. Towards the end prepare your grill. – I have an old gas grill that is only front and back so I cover one side with aluminum foil, poke a few drip holes and replace the grates. On the open side I place the woodchip pouch I made while the grill is heating up to high. Place the meat on grill fat side up, over the aluminum foil side to get as close to cooking with indirect heat as I could. Next year I swear I will buy a new grill. Cook for another 3-6 hours checking the internal temperature toward the 3 hour mark see below for end temp 180-185. I also would watch the temp of the grill remember with smoking low and slow is the trick. I would open the grill cover from time to time to drop the temperature down around 225 degree. Whn you reach the correct internal temp place the meat directly over flame and about cook 10 minutes each side. When done place on platter cover loosely and let sit for about 15-20 minutes. Trim the fat off by running knife under it and put aside there is a lot of great meat and burnt ends in there. You should have most of the fat removed, now cut thin slices ACROSS the grain. Serve with your favorite BBQ sauce, coleslaw, corn and beverages in my case only one beer. 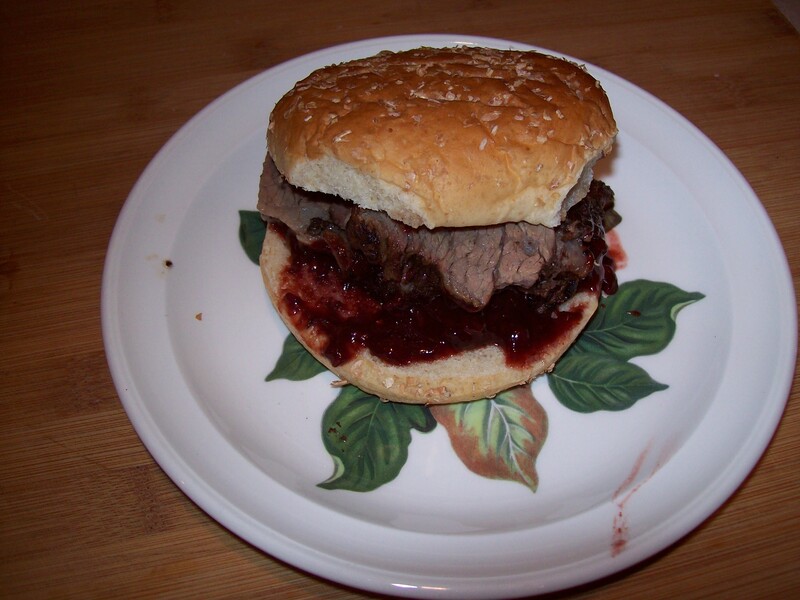 With the flat fat piece you remove trim all the meat out and chop it mix with BBQ sauce and serve on buns. Remember you have to have a lot of will power because it is tortuous smelling this cooking all day. 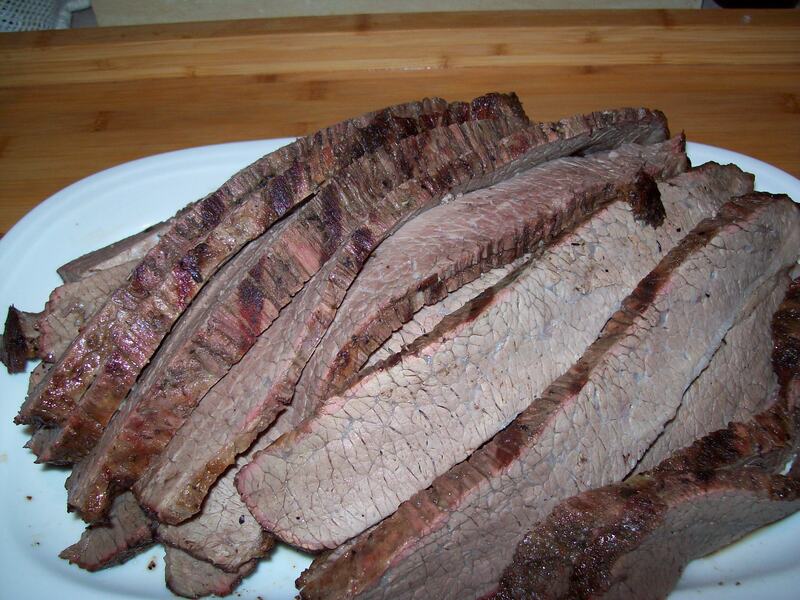 Barbecue experts with years of cooking experience say a brisket is done when it’s “fork tender”, meaning that a fork or a probe thermometer goes in and out of the meat with little resistance. 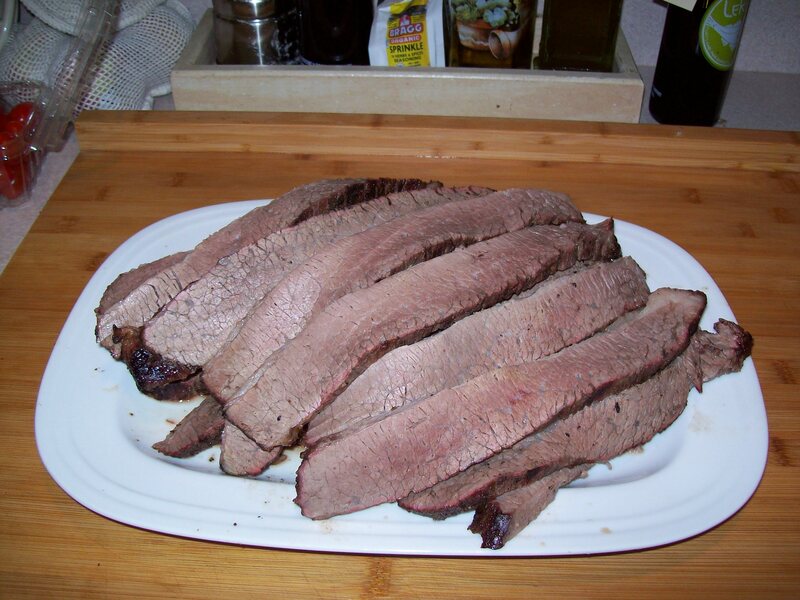 The problem is that both a properly cooked brisket and an overcooked one will both be “fork tender”. For most folks like you and me, it’s best to rely on internal meat temperature to determine when a brisket is properly cooked. What most everyone does agree on is that a properly cooked slice of brisket should pull apart easily, while still maintaining good texture. Technically the meat is done at 160°F but continue on for more tender meat. An overcooked slice will fall apart when picked up. 188°F and 190°F seem to be the most popular target temps. When I barbecue a brisket entirely I cook to an internal temp of 185-190°F. In this temperature range, the flat will be fork-tender and the slices cut from the flat will hold together. Remember Slow and Low is the trick. This entry was posted in Beef, Information, Meat, Patriots Game Day and tagged Aluminium foil, Barbecue, Barbecue grill, brisket, Burnt ends, meat, Temperature. Bookmark the permalink. I am eally loving the theme/design of your site. my blog not working correctly inn Explorer but looks great in Firefox. I used to get the same thing at times especially in Internet explorer. Suggest that they add site to compatibility in tools menu. That might help them.